The information detailed below has been obtained from various sources, and is as complete as possible. In many cases the record only indicates when a church was in use - it may have been in existence before that. Additional information or corrections, however small, are welcomed. The purpose of this page is to provide a free resource for family historians. Bethel Baptist Chapel, Knapp Rd., facing St. James's Square. Built 1840, known later as Regent Chapel, nonconformist. Later used by an estate agent. Built 1808-9 of brick with a stuccoed facade bearing the date and name of the building. Designed by Edward Smith a local architect. 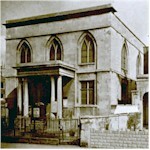 Cheltenham's earliest surviving nonconformist chapel. Later used by Congregationalists, Presbyterians and the Salvation Army. A small graveyard adjoins the chapel, was opened in 1810 and containsd some 19th century headstones. Knapp Road, Cheltenham. Facing St. James Square. Formerly Bethel Baptist Chapel. The Baptists closed the chapel in 1951. It was then used by the Mormons, and, latterly the Christadelphians. Clare Street, Cheltenham. Built early 19th Century as 'The Tabernacle' and used for a short while in 1843 by Baptists seceders from 'Salem Chapel'. In later life in commercial use, it was demolished some time after 1971. Built in 1852, designed by Samuel Onley. Building acquired in 1932 to make way for Odean cinema. Congregation moved to Highbury Congregational Church. Built 1812, the first Wesleyan chapel in Cheltenham. Built 1936, replacing an earlier building. Built 1836 next to a house where the Friends had met since 1702. Taken over by the Unitarians until their move to Bayshill in 1844. Built about 1836. Used by various denominations, including Primitive Methodists; Independents (from about 1848) and latterly by the Baptists. The chapel's original site was on the southern side of the Tewkesbury Road and this was demolished when the then gas works were extended about 1836. Built 1817-8, former Snow's Chapel, after the Rev. Thomas Snow's removal from 'Portland Chapel', Sold in 1827 to Congregationalist in 1827 who renamed it 'Highbury Chapel'. In 1852 it became a Sunday school when a new chapel was opened in Winchcombe St. Now a youth club hall. Opened 1934, to replace the Congregational Church in Winchcombe Street. Built in1820-3, architect George Allen Underwood. When originally built the majority of the pews were privately owned by the shareholders who had paid for the building of the church. Built 1816 as a private chapel at the expense of Robert Capper, J.P. of Marle Hill. First minister Thomas Snow, who was removed after he adopted Strict Baptist views. See Highbury Chapel. Built 1956-7 to replace a small chapel. Built 1843-4 in Gothic style, nonconformist. Reporting its consecration the Cheltenham Journal wrote 'the florid style of its architecture, and magnificent Gothic windows seem particularly to contradict the simplicity and lowliness usually sought to be attached to dissent in this country'. Now (1999) converted into a public house 'Festival and Firkin'. Coronation Square, Edinburgh Place, Cheltenham. Consecrated 1959. Built 1885, architect Thomas Arnold A.R.I.B.A. (formerly St. Andrew's Presbyterian Church) Montpellier are in the Gloucester Records office. Founded 1858 for Presbyterian worshippers at the former Cheltenham Chapel, St. George's Square. Built 1825-30 on ground sold by the Earl of Suffolk's daughter and then donated by the Suffolk estate developer, James Fisher. Designed by Edward Jenkins a local architect in the perpendicular style, and finished (roof) by Papworth. When originally built the majority of the pews were privately owned by the shareholders who had paid for the building of the church. Also known as Suffolk Church. By 1982 was being used as a Parish Hall. Built 1827-9 for the inhabitants of the new houses in and around the Upper High Street, designed by John Buonarotti Papworth. When originally built the majority of the pews were privately owned by the shareholders who had paid for the building of the church. Demolished and rebuilt in Victorian Gothic style then finally demolished in 1967. Built 1853-4 on site purchased by Francis Close, designed by Frederick Ordish and paid for by subscription. New burial ground purchased in 1829, chapel built 1831, off Lower High Street (later, Winston Churchill Memorial Garden). Severn Road, Cheltenham. Built 1965-6. Original church of St. Philip built 1844 by Edward Shellard, demolished 1879, first minister J. E. Riddle. Replaced with present SS Philip and James, built 1879-1882 in Gothic style, architect John Middleton. Built 1873-83 to design of John Middleton. Princess Elizabeth Way, Cheltenham. Opened 1967. Prestbury United Reformed Church (formerly Prestbury Congregational Church) Deep Street, Prestbury was founded in 1866. John Middleton, a prominent local architect. He was responsible for All Saints' ; Holy Apostles; St. Mark's; St. Philip & St. James, and St. Stephen's Churches in Cheltenham.